Mamata asks for overthrowing of the Modi Government at the TMC Kolkata Rally saying there has been an “atmosphere of fear” in the country. 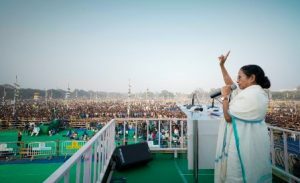 Chief Minister of West Bengal and Trinamool Congress supremo Mamata Banerjee virtually blew the conch shell for the 2019 General Elections at a historic Brigade Ground in Kolkata on Saturday by declaring that the expiry date of the present Modi regime has come and likened the fight for its removal to be the second freedom struggle for the countrymen. 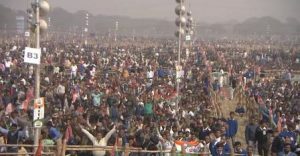 The much-hyped event called the ‘United India Rally’ witnessed the presence of several leaders from different political firmament minus BJP and Left. “The time has come to overthrow the government whose expiry date has arrived. If they win again, they would turn the country into dictatorship rule akin to the rule of Hitler in Germany by amending the constitution. They have destroyed almost every democratic institution in the country right from the Central Bureau of Investigation (CBI), to Enforcement Directorate (ED) and using them to settle scores with the opponents,” she said. “The inflation has gone up and people are facing the heat while the BJP is engaged in burning the country in communal flames. It is like a second freedom struggle for us to overthrow the present government,” she further said to a thunderous applause by the sea of TMC supporters that had began to thrown in large numbers at the ground since the wee hours of morning. She also accused the government of ignorance stating, “The farmers are committing suicide while traders are suffering due to the draconian taxes but the government has been ignoring everything”. “People who are raising their voices are branded as traitors and booked under false cases. This has created an atmosphere of fear in the country,” said the firebrand leader of Bengal who is trying to project herself as the glue that would bind the anti-BJP parties. More than 16 national leaders, including three present chief ministers Arvind Kejriwal, Chandrababu Naidu and HD Kumaraswamy; and former chief ministers Farooq Abdullah, Omar Abdullah, Akhilesh Yadav and Gegong Apang attended the rally. Congress sent its senior leaders Dr. Abhishek Manu Singhvi and Mallikarjun Kharge at the rally who read a letter sent by the former party president, Sonia Gandhi. Calling Mamata Banerjee, “the tigress of Bengal,” Arun Shourie, said that the BJP government has made the life of people miserable through its faulty policies of demonetisation and implementation of Goods and Services Tax (GST). “The present regime must go as these two policies badly impacted the poor and middle class. They would not have gained power in Gujarat had the Opposition been united. The economy is in tatters. The BJP has also been shamelessly trying to occupy power in Karnataka through an illegitimate way. The Opposition should project a single candidate against the candidate of rival BJP to prevent the votes from getting divided. We should have an ‘Arjun’ like vision and aim for victory rather than thinking about minor differences. We have to approach with a sense of sacrifice rather than sense of calculation,” he said. Shatrughan Sinha, the trojan horse of saffron party asked the Prime Minister Narendra Modi to come clean on the allegations of corruption in Rafeal deal hurled by the Opposition. “People will not call chowkidar chor hai (sentinel is a thief) if you do come clean on the charges levelled against you. The democratic set-up under the regime of Atal ji has now got transformed into dictatorship. I am just trying to show mirror to the present regime and change is our common goal,” said the actor while drawing applause from the crowd for his Bollywood dialogue, ‘Khamosh’. Almost all the leaders on the dais spoke about Opposition unity and a need to eject the BJP government rather than thinking about the coveted post of the Prime Minister, “The need of an hour is to install a government at the centre that will try to restore a sense of respect for the government agencies that has come under danger under the present government. The BJP is responsible for dividing people and for present crisis in Kashmir. They are vociferous on triple talaq but silent on Women reservation bill. It is now time to overthrown them by collective effort,” said Farooq Abdullah, the former chief minister of Jammu and Kashmir. The opposition leaders unanimously raised questions on the authenticity of the Electronic Voting Machines (EVM) in the coming elections. “We are planning to meet the Election Commission soon in Delhi to urge them to ensure that no tampering is done with EVM machines during the General Elections. We want the use of ballot boxes but it is not possible as polls are near,” said Mamata Banerjee. The BJP, however, dubbed the mega event as a political tourism stating that “It was a political tourism of leaders who are fast losing their credibility and ground”. Also read: Would Index of Opposition Unity work against NDA? “It was a drama by corrupt politicians. I think they will decide PM candidate through a lottery or coin toss. The BJP regime doesn’t have an expiry date because he (Modi) never takes allopathy medicines,” said Bengal BJP chief Dilip Ghosh in a reply to the jibe of the Bengal chief minister that the expiry date of the BJP has arrived. The Left though condemned the saffron party for its wrong policies but equally held the Bengal CM responsible for the plight of the people. “She claims to be fighting against atrocities but the recent panchayat polls showed how the rival candidates were attacked. The Opposition parties are even not allowed to hold rallies and protests in the state and democracy is being muzzled,” said Surjya Kanta Mishra, a senior CPIM leader. The Trinamool Congress succeeded in putting up a show of strength before the political leaders as several lakhs of people from across the state attended the event. Commuters, however, had harrowing experiences as traffic went haywire across the city. Can Universal Basic Income eliminate poverty?